للمسافرين الذين يرغبون أن يعيشوا كل ما تقدمه المدينة، ستاي مارجريت ريفر هو الخيار الأمثل. يمكن من هنا للضيوف الاستمتاع بسهولة الوصول إلى كل ما تقدمه هذه المدينة النابضة بالحياة. يضفي محيط الفندق اللطيف وقربه من أكثر المعالم السياحية جذبًا سحرًا خاصًا على هذا الفندق. يقدم ستاي مارجريت ريفر خدمات لا غبار عليها وكل أشكال اللياقة وحسن الضيافة اللازمة لإسعاد ضيوفه. تتضمن الميزات الرئيسية في هذا الفندق: خدمة التنظيف يوميًا, مرافق مخصصة لذوي الاحتياجات الخاصة, تسجيل وصول/مغادرة سريع, تخزين الأمتعة, واي فاي في المناطق العامة. تنعكس أجواء ستاي مارجريت ريفر في غرف الضيوف.شاي مجاني, مناشف, قهوة فورية مجانية, تلفزيون بشاشة مسطحة, بياضات هي بعض الميزات الموجود في العديد من الغرف. إن مسار جولف - ضمن 3 كم, مسبح خارجي, ملعب للأطفال, حديقة هو المكان الأمثل في الفندق للاسترخاء وتفريغ طاقتك بعد نهار طويل. إن ستاي مارجريت ريفر هو خيار ذكي بالنسبة للمسافرين، فهو يوفر إقامة هادئة ومناسبة للاسترخاء. Friendly and courteous staffs especially from the restaurant! Great location! Spacious Room except that the bed is too soft (needs to be changed). Bathroom is disabled friendly, so it's good for elderly to access. But the bathroom floor ought to be washed as lots of dirt between the floor tiles were accumulated. Willow Grill restaurant serves great food! Do try your meals at that restaurant. Will recommend my friends to stay and will stay again. Great stay. Emma and Marika helped in Wife birthday celebration. Even provided a complimentary wine and card for my wife. Stay provide credit to use in restaurant which is great, like a discount to the stay. And free mini bar which is great. The room is clean and spacious. Overall highly recommended. Loved the outlook of the place and the comfort of the room. Facilities were pleasant too with mini golf course, swimming pool and a human size chess set. UV light in toilet for warmth on cold days. $75 credits given for hotel spendings too! Fantastic rate in a modern and comfortable motel, booking over a few nights. Also bonus of stay 5 nights and get a 6th free, which accrues (don't have to stay 5 nights in one visit). Only downer are there are no cooking facilities in room (toaster / microwave). Arrived to be pleasantly surprised with a free bottle of wine, $75 dining credits at the in house restaurant, and free mini bar items. Well, it’s margaret river right? Can’t go without the wine. The room was clean and nice. We had some issues with the new heater which didn’t become warm enough in the winter. The manager asssisted us in with a portable heater which partially managed the issue. Probably won’t stay there again if given a chance but generally it’s a satisfactory stay. We stay one night here on my partner birthday and they compliment us with champagne for his birthday. The minibar also free some snack, soft drink, water and two beers. The bed is so comfy I don’t want to wake up the next morning. The place is really lovely. The only thing on our stay was the internet was very bad, can’t really connect to it. But if they fix internet problem it will be very great! This hotel and all its deferent optional rates on rooms, dreakfast, mini bar and hotel credit is one off the best I have stayed at. With its location to Margeret river and all other parts off the south west very handy. 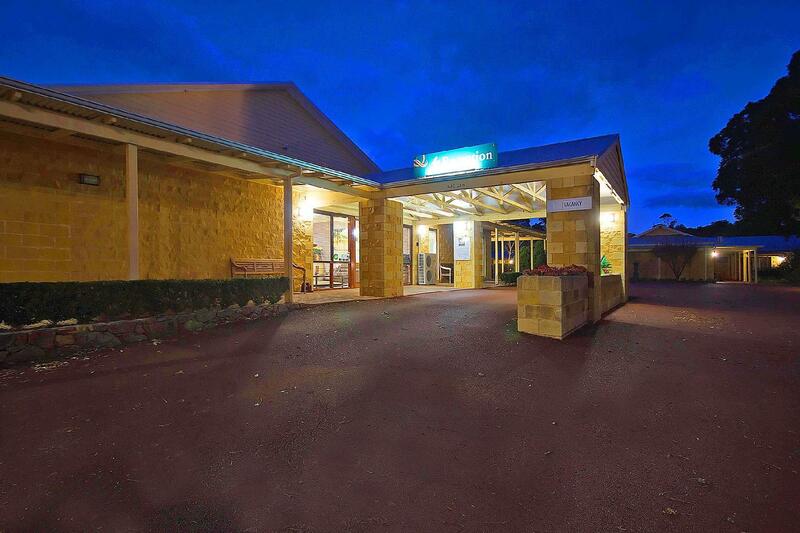 Ideally located close to the town and a short stroll away from one of the best wineries in the area, this hotel has great facilities. It has an ok restaurant, free mini bar and a pool. It is very clean. The decor is a bit old fashioned . You are given $75 voucher on arrival to use at the bar or the restaurant which is very convenient for breakfast or a quiet dinner. They also provide useful information on the region. Every year I will stay there for 1 night only as a traveller. And was at 1st quite happy that this is the only hotel that I’ve been offer all mini bar items for free. This year I brought my 2 kids along, this we stay 2 days to walk around with them. Didn’t know that they only give you 1st day free supply despite how many days you stay. I’ve questions their manager so if I were to stay for 1 week, I only get 1st set of supply? Then we should check in and out Everyday to get new supply. They also don’t even at least give us 2 free mineral water even they don’t give other things. Ridiculous hotel policy. So funny. The day when I reached at 6pm, their front desk staff just about to knock off. Don’t even bother to change my kids room to twin. Say tomorrow then try when there is other staffs around. Oh my god, what kind of service they have. Hotel restaurant also closed. We spent the weekend in Margaret River, and enjoyed our stay at "Stay". Rooms are large, comfortable and well equipped. The surroundings are natural and tranquil, and just right for relaxation. The restaurant offers a variety of international dishes including an Asian menu, and a choice of affordable wines. The location is just out of town, and so either a long walk or use your car. Well managed motel with nicely equipped clean rooms. The decor and fittings have been well chosen. Overall our stay felt very comfortable. Our room had a rear patio overlooking cultivated natural bush plants and pond. Stayed for 2 nights in July and found the hotel to be absolutely value for money. It's quiet and peaceful while still being within walking distance to Margaret River town. Room was large, beds were comfortable and the heater a/c could be controlled easily. Staff were friendly and welcoming. Also tried the hotel restaurant for breakfast and was impressed with the food quality and wait staff service. Would stay again. Quality Inn had very good service where it was a joy to see employees enjoying their work, their service was excellent, gave clear and detailed explanation and would always go the extra mile! Their bed was very comfortable and I had a good night's rest thanks to their bed! Lastly, it is very near to the town! Loved the place. Rooms are spacious and clean with good facilities. Quiet location. Staff friendly and courteous. Excellent food in the restaurant. This motel has all that a visitor could want and need at an affordable price. From the warm welcome we received on arrival to the fantastic well appointed motel room we stayed in this place is the best we have ever stayed at in Margaret River. The restaurant with its warm fire place is the spot to park yourself after a day of indulgence at the wineries, brew houses, chocolate factories and cheese factories of the Margaret River region. We will definitely be staying here again. If your looking for a place to stay where people are taken care of as people this is it. From the percolated coffee on request at the bar beside the fire place; to the fresh set of towels left when you choose not to have your room tidied; to the trust the establishment extends with their take and watch without registering DVD collection. All these little things together with the warmth of the staff made us feel welcomed and valued. We will be staying here again. Thank you all so much for making our holiday with you a great experience. Bless you for going the extra mile.